For centuries a residence of the aristocracy – princesses, marquises, sultans and tsars. And since 1873, an elegant and charming five-star resort; one of the most celebrated in the world. Luxury lake views exemplify the art of living well in a suggestive experience that fills the eyes and inspires the mind. Overlooking one of the most romantic lakes in the world, Lake Como, Villa d’Este is surrounded by a wonderful 10-hectare private park. The rooms and suites, overlooking the lake or the park, are divided into two buildings: the Cardinal Building and the Queen’s Pavilion. Windows and terraces overlooking the lake, with exceptional views of the marina and boats quietly returning to shore in the evening. Are you ready to immerse yourself in this dream scenario? Luxury also means privacy and the possibility to gather in a small private world, to live in a personal and independent way your stay in a magical place. If you are looking for these emotions, you can rent four 19th-century villas on the property: Villa Cima on the lake shore, Villa Malakoff, Villa Garrovo and the Mosaic House in the park, all equipped with services that live up to our Hotel. Dinner time. We get ready, we cross the majestic rooms to reach a view that has no equal in the world. A “Bellini” on the terrace while the sun sets on the lake. And after a dream, another dream, the exclusive hospitality of the Veranda restaurant. Almost a theatrical scene: a ballet of maîtres and sommeliers attentive to your every wish. The Sporting Club of Villa d’Este offers a swimming pool, gym, tennis and squash courts. 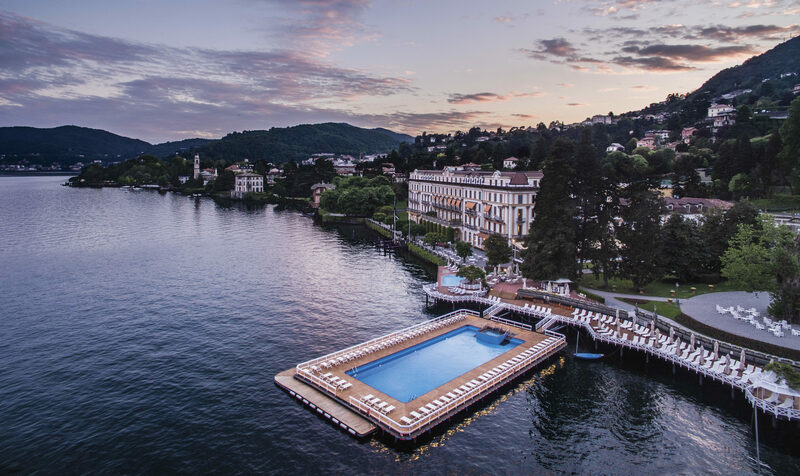 In the summer it is wonderful to swim in the famous floating pool on the lake. Sporting Club’s crown jewel is Villa d’Este Golf Club: among chestnut, birch and pine woods, the 18-hole course is one of the most difficult “par 69” in Europe.